Privacy Enhancing Technologies (PETs) play an important role in preventing privacy leakage of data along information flows. 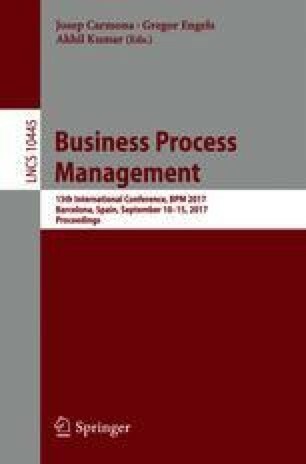 Although business process modelling is well-suited for expressing stakeholder collaboration and process support by technical solutions, little is done to visualise and analyse privacy leakages in the processes. We propose PE-BPMN – privacy-enhanced extensions to the BPMN language for capturing data leakages. We demonstrate its feasibility in the mobile app scenario where private data leakages are determined. Our approach helps system builders make decisions on the privacy solutions at the early stages of development and lets auditors analyse existing systems. The authors would like to thank Prof. Marlon Dumas, Peeter Laud and other members of the NAPLES project for discussions, comments and feedback concerning this study. This research was, in part, funded by the Air Force Research laboratory (AFRL) and Defense Advanced Research Projects Agency (DARPA) under contract FA8750-16-C-0011. The views expressed are those of the authors and do not reflect the official policy or position of the Department of Defense or the U.S. Government. This work was also supported by the European Regional Development Fund through the Excellence in IT in Estonia (EXCITE) and by the Estonian Research Council under Institutional Research Grant IUT27-1.